The book begins with Dominique Monaghan, a second tier model having an affair with an ex-boxer who married another woman for money. After Dominique discovers he’s cheating on her, as well, she slips a muscle relaxant into his drink, hoping to get him talking about the wife and affairs all while recording the conversation for blackmail purposes. The plan goes awry when some guys with guns burst in and kidnap both of them. This isn’t your average kidnapping. In one entertaining passage, Dominique is schooled by one of the accomplices on the many reasons for kidnapping. This section has the darker motives and even darker humor of Davidson’s short fiction work. After a little over a hundred pages, the book goes into hard-boiled sleuth mode as we follow Dominique’s brother Desmond as he tries to find her. The search puts him up against Gary’s diamond-for-a-heart wife and more than a few unhinged criminals. Davidson has a gift for taking you seamlessly through these different point-of-views and sub-genres. By crafting many well placed reveals and twists that become a part of the pace, she makes the reader accustomed to the speed at which she likes to change it up. There’s also a theme of the importance of family weaved throughout the book that binds it together. All three of the characters come from broken homes and the double edge sword of bother-sister relationships. 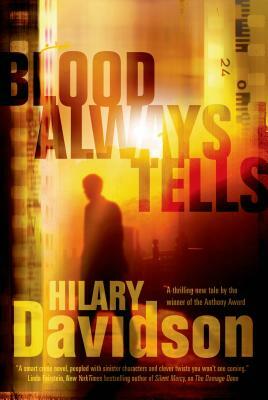 Blood Always Tells is a fresh and engaging read. It plays with genre and narrative in a unique way, not flinching when it comes to the characters and their past. I look forward to Hilary’s next walk on the wild side. Blood Always Tells is available for pre-order on our website. Hilary Davidson will be in the store on Thursday, April 24 at 7PM speaking & signing copies of the book. Click here for more information & to pre-order your signed copy.